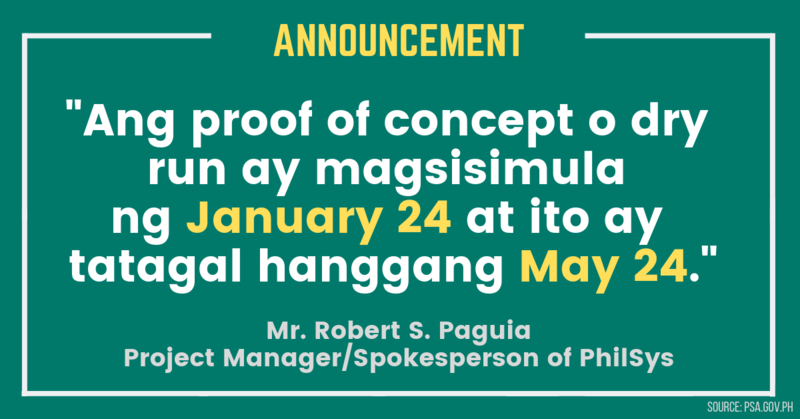 The Dry Run or Proof of Concept of the National ID System will start on January 24, 2019 according to Mr. Robert S. Paguia, Project Manager/Spokesperson of PhilSys. Mr. Paguia appeared on a radio program of Philippine Statistics Authority (PSA) called PSA Serbilis sa Radyo. You can watch the whole interview on the Youtube link below or at the official Facebook Page of PSA. Here are some of the highlights from the interview of Mr. Paguia as the representative if PhilSys Office. Is the registration for National ID free? The initial application and issuance as well as renewal of the PhilID for citizens shall be free of charge. Renewal shall pertain to the replacement of the PhilID arising from recapturing or updating of biometric information. What’s next after the Dry Run? The Dry Run (Proof of Concept) will be done to test the system and the processes for PhilSys. PSA will test registration, validation, all the process in between, up to the issuance of the Philippine ID. After this Dry Run, the PSA will target to register 5 million individuals starting September 2019 until December 2019. Then yearly, around 25 million individuals from 2020 to 2023.